There are relatively few Twitter experts on affairs inside Syria, which has created unusual and sometimes troubling associations between the people who regularly report and discuss events of the ongoing war. Shami Witness, a civilian tweeting about Syria since at least November 2011, is perhaps the best example of this phenomenon. Shami, who is not connected to any armed group, regularly interacts with some of the foremost experts of the increasingly complex conflict. His access to and understanding of what's happening on the ground make him a useful source of information. Shami's analysis has been published by Jihadology, a clearinghouse for information relating to Global Jihadism run by prominent expert Aaron Zelin, and on the blog of jihadi expert Pieter van Ostaeyen. The Telegraph and The Daily Mail, describing Shami as an activist, quoted him in stories after the Nobel Peace Prize was awarded to the organization working with the Assad government to remove 1,300 tons of chemical weapons from the country. But Shami has become much more than an anti-Assad activist or jihadi analyst: He is a staunch supporter of Islamic State of Iraq and al-Sham (ISIS), a group formerly known as al-Qaeda in Iraq (AQI) that still receives instructions from al-Qaeda's core leadership. The U.S. State Department designated AQI a foreign terrorist organization in October 2004 and considers the ISIS to be "the most dangerous players" in the region at this point. Shami sees ISIS as the most effective force against Iran and advocates the group's rise. "As sectarian as it may seem, I consider Iran a worse threat to Sunnis than Israel," Shami, whose age and nationality are unknown, told Business Insider. "The only way Iran gets defeated is one project stretching from" Beirut, the capital of Lebanon, to the Diyala province on Iraq's eastern border with Iran. 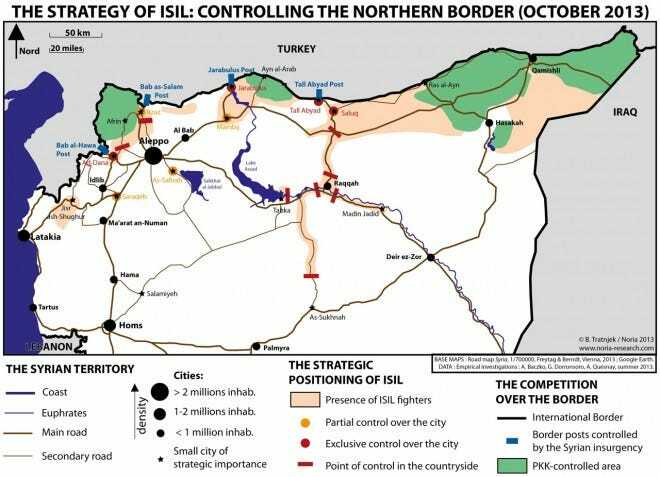 Over the last year and a half, ISIS has been implementing its plan for a seventh-century style Caliphate in the middle ground that is northern Syria. Syria provides ISIS with "continuous muhajir recruitment, oil and other revenues, [and] lots of territory to escape back in trouble," Shami noted. In the process of imposing strict Sharia law in various towns, the group has committed abuses including abductions of journalists, arbitrary detentions of activists, public beheadings and other summary killings, torture, and assassinations of Free Syrian Army commanders. Shami told BI that he doesn't "agree with many ISIS tactics, especially [the] arrest of journalists," but supporting ISIS's overall project has led him to defend many of the ways it executes the plan. After Amnesty International reported that ISIS had been detaining and flogging children as young as age 8, Shami defended the group by asserting that they don't torture anyone under 14. After reports of ISIS being involved in the massacre of civilians — including women and children — in pro-Assad towns, Shami asserted that his ISIS bros didn't have the stomach to commit such atrocities. Nevertheless, he has allies. Aymann al-Tamimi, an Oxford student and Fellow at the Middle East Forum think tank in Philadelphia, has published Shami on his blog, cites him, and considers him a friend. "He is a knowledgeable person so I gave him space to write," Tamimi told BI. "He is also courteous towards me and respects the fact I don't share his perspectives." Shami has become more controversial as the group has become more isolated. Earlier this month, other rebel groups attacked ISIS after the group abducted, tortured, and killed a popular doctor who was a member of the hardline rebel group Ahrar al-Sham. The Islamic Front, the largest rebel coalition, subsequently accused ISIS of being "worse than the Assad regime." Shami is clearly on the ISIS side of the ongoing dispute. He described the nonviolent Syrian revolutionaries in Kafranbel — considered the heart of the Syrian revolution — as "idiots" when they began to protest against both ISIS and the Assad regime. All the while, he remains a noticeable voice in the Syria discussion.